Divergence movie Night is a monthly not-for-profit event where Pink Triangle Services aims to show GLBTTQ-related cinema. The goal of this night is to shed light on the huge array of GLBTTQ issues in the world, and to promote education and discussion about them. 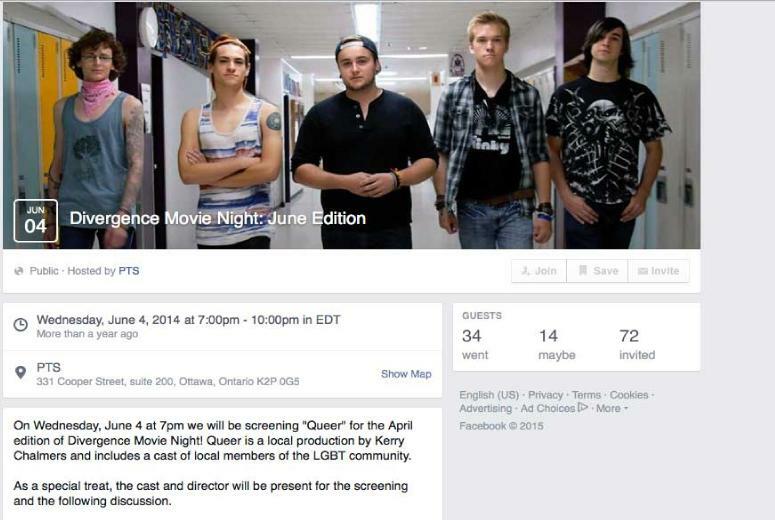 On June 4th 2014, Dream Weaver Communications Inc. presented a pre-release version of Queer to about 45 youth and adults. Most of the cast attended as well and participated in an extensive discussion at the end of the movie. Everyone was impressed both with the production and the content and felt strongly that it should be shown on a much wider basis. Some of the youth knew Jamie Hubley, who had previously attended Pink Triangle Youth, and were very moved by the messages that it promoted and how they would have related to him.